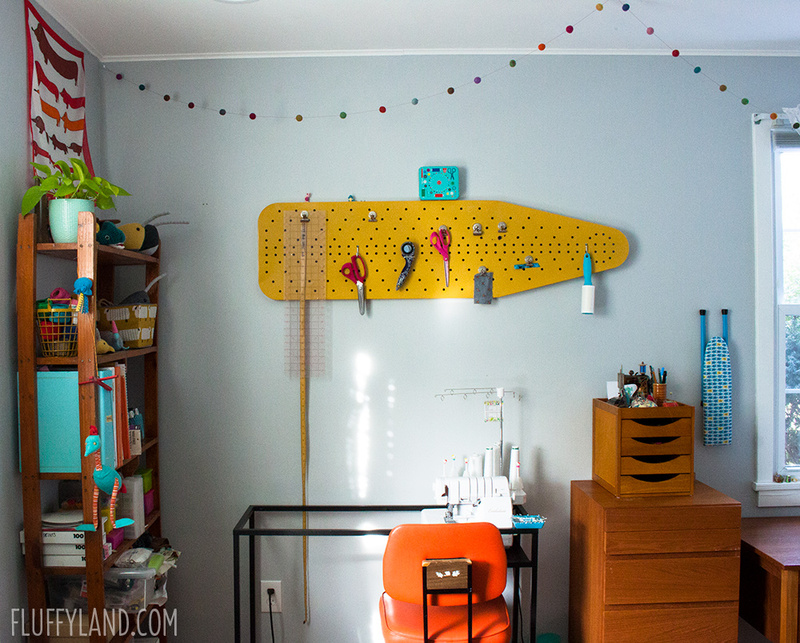 Welcome to my new sewing room! It’s my favorite room in the house: this is where the magic happens. Out of all the rooms, this one has taken the most tweaking to get it just how I like it. It’s a never-ending process, but I love where it’s at right now so it’s time for a tour! First of all, this room is huge and bright. There are two windows, and I added four recessed, dimmable LEDs in the ceiling so I’m never lacking for light. I painted the walls gray, like I’ve always dreamed, and I’ll never fall out of love with that original hardwood. When you enter the room, the far wall holds my two main machines: regular Juki (she’s new! and i love her!) and my Babylock serger (also very loved). The dresser in between holds supplies: quilting rulers, needles and pins, screwdrivers and spare parts. 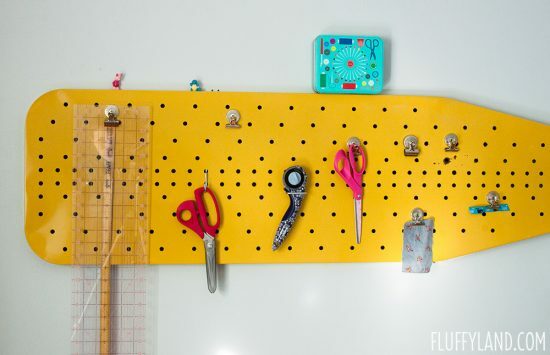 The small wooden drawers on top hold the easy-access notions: scissors, snips, chalk/pens, seam rippers. I found this ironing board the week after I moved in: it was propped against my neighbor’s trashcan, waiting for its trip to the landfill. I couldn’t resist the color, so it came home with me, I removed the legs, and now it’s my magnet + peg board. The Juki came with its own table, so I shortened this desk by chopping a few inches off the legs to make it an ideal sewing height. The desk was a steal at a recent estate sale: I found it in the corner of a shed, and the top was all dusty, so they let me have it for $20. Its two drawers are perfect for holding the Juki manual, presser feet, and extra bobbins, and the best part is that the drawers are just small enough that I’m not tempted to clutter them up with less related things. I try to keep this little table near the entryway clear for sewing lessons – if someone brings her own machine, that’s where we set it up. The rolling cart underneath holds my plywood sheets for laser cutting, and it’s easy to roll out of the way when I need that space. The cutting table lives in the center of the room, and I finally live in a space big enough for the table to hold both leaves. It’s sheer luxury to have a table this big and flat and ready for whatever I throw at it. 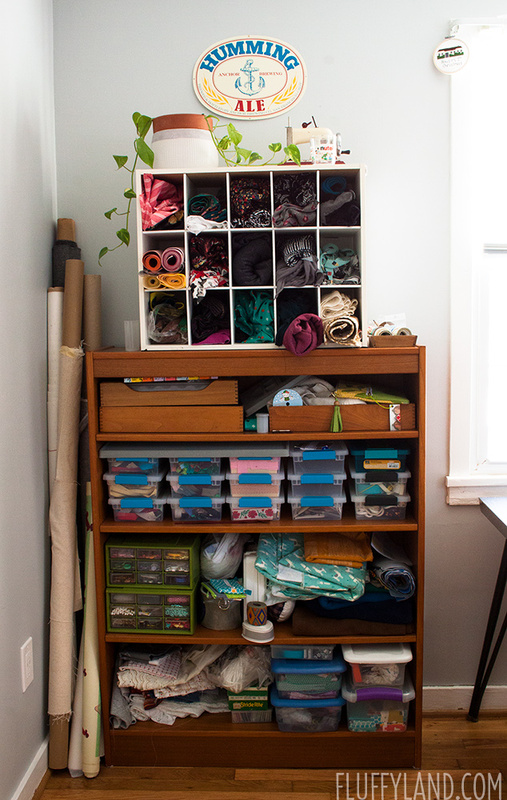 I have two rolling drawer units underneath: one holds all of my “neutral” fabrics: white/black/gray cottons, knits, or linings ready to accent whatever I’m making. The other holds larger cuts and my trusty paper cutter lives on top, ready to roll into action. The white shoe divider is dedicated to fabrics with an intended purpose: the “on-deck” shelf. The bookcase holds my trims, buttons, and, currently… the fabrics I haven’t managed to put away elsewhere. I just got most of those blue-handled bins for Christmas and it was so satisfying to finally sort all the zippers, bias tapes, and cording into their own bins. 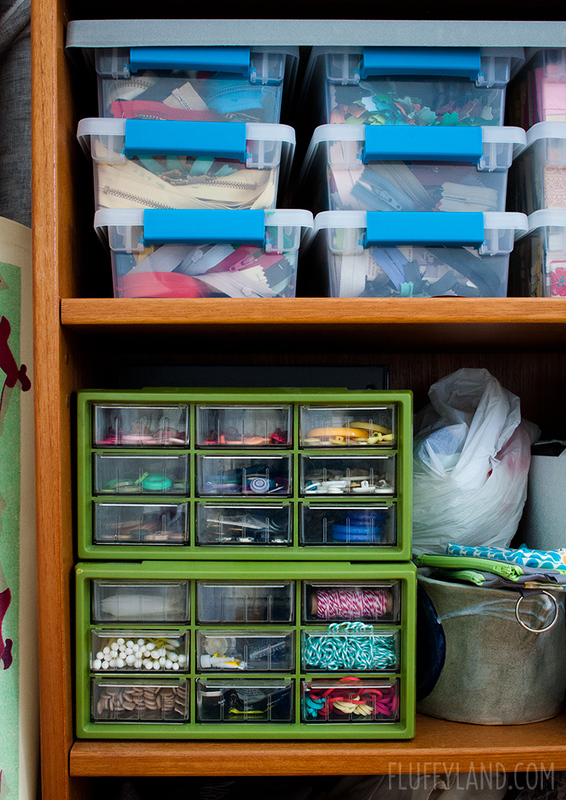 This vintage drawer thing holds my buttons, sorted by color, and other handy supplies like q-tips, popsicle sticks, small glues, baker’s twine. Another estate sale find from a while back, it wasn’t super dirty when I got it, but I ran the drawers through the dishwasher and they came out sparkling. 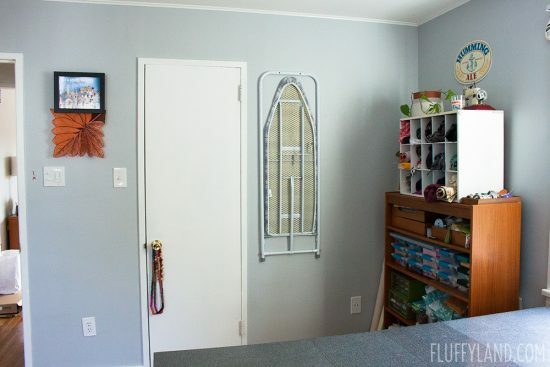 I mounted an over-the-door ironing board to the wall to save space. 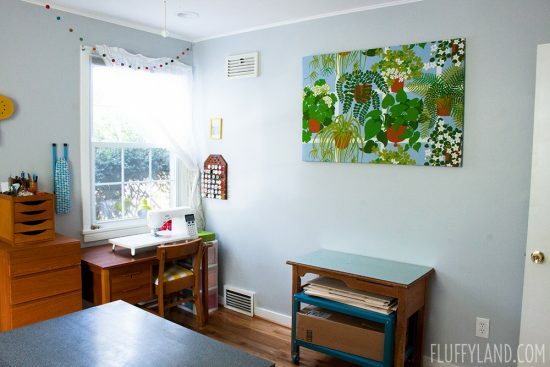 That was another big deal for me – not only do I get two leaves in my cutting table, but I get a full-sized ironing board! That’s the closet door, and to the far left is the door back out to the rest of the house. Here’s my closet: another splurge in clear, clip-top bins. It feels amazing. 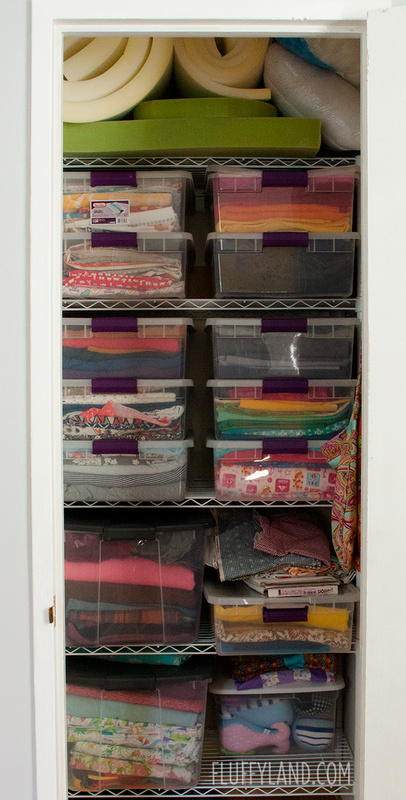 My fabric has never been so organized, and the half-height bins mean a lot less digging is required. 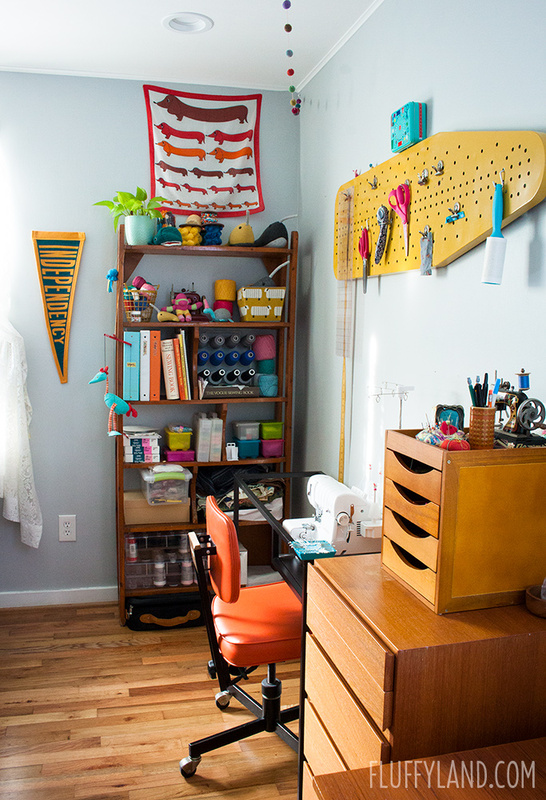 All the fluff – foam and polyfil – lives on the top shelf. 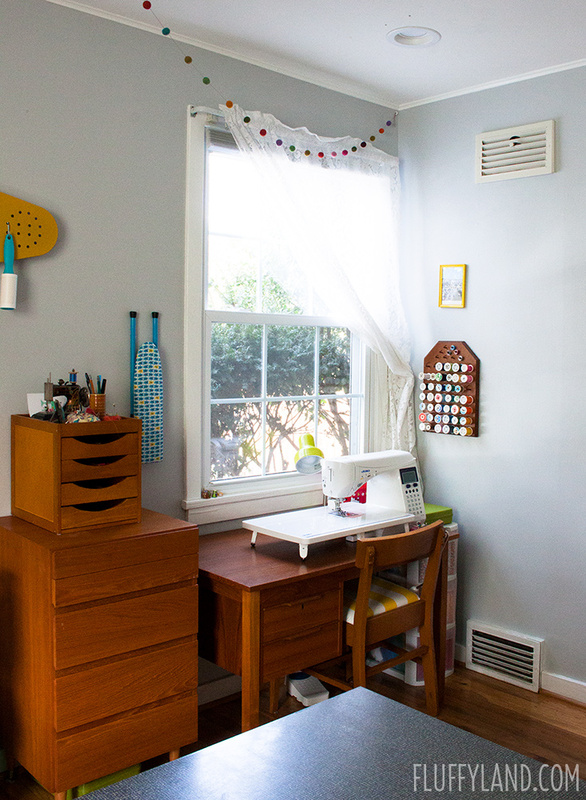 And that’s my sewing room! It’s certainly not always this clean, but so far I’ve been making a good effort to keep it organized. 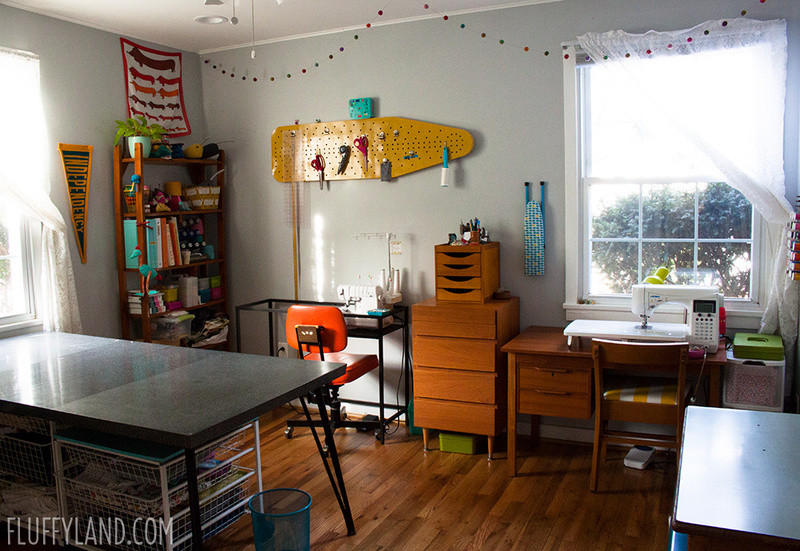 It’s a wonderful place to sew, craft, and teach. Thanks for coming on the tour with me! 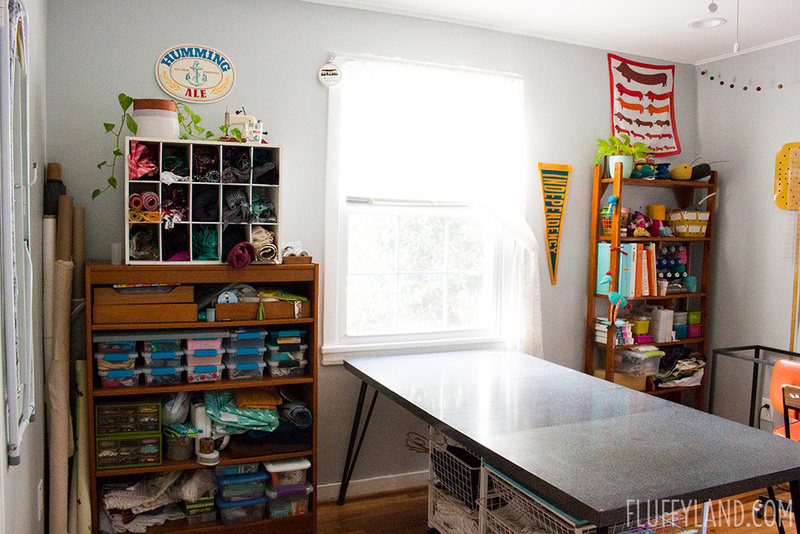 Love, love, love your sewing room! I think it’s the nicest one I’ve seen so far, great job!